First Holy Communions will be on May 12. Easter Time March 10 - June 16, Trinity Sunday. All Catholics over the age of seven must receive Holy Communion at least once during this time to remain in the good graces of the Church. A MOST BLESSED FEAST OF OUR LORD’S GLORIOUS AND TRIUMPHANT RESURRECTION! Spend a few minutes after Mass sharing the joy and graces of this blessed day with your fellow Catholics. There will be "Easter egg cookies" to break your fast after each Easter Mass (including Midnight Mass). Enjoy! Easter wishes His Excellency, the Most Reverend Bishop Mark Pivarunas, as well as the priests & Sisters who serve our needs wish us all a most glorious & happy Easter season. CONGRATULATIONS, Sr Mary Franziska on your final & perpetual profession as a religious Sister in the Congregation of the Mother of God. We will pray daily for your sanctification & perseverance in your Sacred Alliance with Christ, your beloved Bridegroom. Communion Rail Cloth is meant to reverence the Sacred Host and any particle of It. Please place your hands beneath this cloth if possible whenever receiving Holy Communion. Reign of Mary issues are located in the church vestibule for an offering of $5 (to the bookstore). This is the best publication that completely supports our very strong position on the present Ecclesial situation. A Catholic Centenarian! Congratulations to Mrs Aurilia Trujillo of Aguilar who turned 100 this past Wednesday!! See her! One moment in desolation worse than death. The next, at His feet, in His embrace. She has fallen at His feet, for He is God. He has folded her in His arms, for He is her Son. Were ever tears so blissful, Mother, as those which were wiped away by the Hand of thy Son and thy God in that first hour of the Resurrection? O blessed among women, blessed by all generations, enter into the joy of thy Lord; share in the triumph of thy Son! Our saint followed the legal profession in his early life and became "the poor man's lawyer". He scrupulously avoided all detractions and accusations that could affect the reputation of his opponents. Disenchanted with the evils associated with his profession, he determined to become a Capuchin (Franciscan) friar. In religion he received the name of Fidelis, or "faithful" . He offered his first Mass on the feast of St Francis of Assisi in 1612. Many were reformed by the zealous labors of Fidelis, and several heretics were converted. The Calvinists, incensed at his success, loudly threatened Fidelis' life, and he prepared himself for martyrdom. On April 24, 1622, Fidelis made his confession, celebrated Mass and preached. At the end of his sermon he suddenly stood silent, his eyes fixed upon Heaven. He foretold his death to several persons in the clearest terms, and began signing his letters, "P. Fidelis, prope diem esca vermium" ("Father Fidelis, in days ahead to become food for worms"). His companions noted that he was particularly cheerful. From Grusch (his home) he went to preach at Seewis, where, with great energy, he exhorted the Catholics to constancy in the faith. After a Calvinist discharged his musket at him in the Church, the Catholics entreated him to leave the place. He answered that death was his gain and his joy, and that he was ready to lay down his life in God's cause. On the road back to Grusch, he met twenty Calvinist soldiers with a minister at their head. They called him a false prophet, and urged him to embrace their sect. He answered: "I am sent to you to confute, not to embrace your heresy. The Catholic religion is the faith of all ages. I fear not death." One beat him to the ground by a blow on the head with his backsword. Fidelis rose on his knees and stretching forth his arms in the form of a cross, said feebly, "Pardon my enemies, O Lord: blinded by passion they know not what they do. Lord Jesus, have mercy on me. 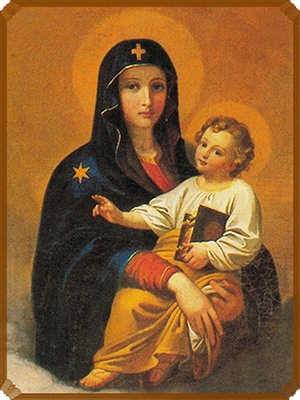 Mary, Mother of God, succor me!" Another sword stroke clove his skull, and he fell in his blood. The soldiers, not content, added stab after stab with their long knives, and hacked-off his left leg, as they said, to punish him for his many journeys into those parts to preach to them. The rebels were soon after defeated by the imperial troops, which event the martyr had foretold. This fulfillment was sufficient to convert the Protestant minister who had participated in Fidelis' martyrdom. He made a public abjuration of Calvinism and was received into the Catholic Church. risen truly, as He said! bless His Name, rejoice, rejoice! bid us all rejoice, rejoice! To Jesus under the invocation of His Holy Name. In 1455, Pope Callistus III tasked the Franciscans with preaching a crusade invoking the Holy Name of Jesus against the enemies of Holy Church and Christian civilization. They recommended that their hearers have the monogram of Jesus placed over the gates of their cities and above the doors of their homes. Under this banner and reverent invocation, victory came at the decisive Battle of Belgrade in 1456. To Our Lady of Guadalupe, Madonna of the Americas, 1521. To Mary under the title of her Immaculate Conception, chosen as the Patroness of the United States in 1847. To the many saintly and sacrificing missionaries who consecrated our soil with their labors, tears, and blood. To the angel of our country. The Angel of Portugal identified himself as the Angel of Peace. Let us supplicate the angel of our own homeland to "defend us in battle, be our protection against the wickedness and snares of the devil." O God of earth and altar, bow down and hear our cry, our earthly rulers falter, our people drift and die; The walls of gold entomb us, the swords of scorn divide; take not Thy thunder from us, but take away our pride. From all that terror teaches, from lies of tongue and pen, from all the easy speeches that comfort cruel men, From sale and profanation of honor and the sword, from sleep and from damnation, deliver us, good Lord! Tie in a living tether the prince and priest and thrall, bind all our lives together, smite us, and save us all! In ire and exultation aflame with faith, and free, lift up a living nation, a single sword to thee.